Confiscating Gold & Wealth: Most people assume that Roosevelt’s confiscation of gold was unique. There are those who keep insisting that there be a return to the gold standard. What they do not realize is that such propositions are really a call to arms. Government will not return to a gold standard because it would be a loss of power and overturn the very nature of how our republics (not democracies) actually function. If politicians can no longer promise vote for them and they will give you someone else’s property, Marxism and Republicanism would collapse. Democracy was what Athens had. The head of the household went and voted as a “representative” of everyone in the house. This has been distorted saying women do not have the right to vote. The solution is you vote for a representative that has no personal connection and thus is really a professional politician. That system deprives all citizens of voting on every issue. The professional politician votes and thus you lose control of the state as was the case in the Roman Republic leading to revolution and war. A return to the gold standard would alter everything within the political structure. To create such a system means Republicanism must be replaced with a real Democracy. Roosevelt was not the only example of a confiscation of gold. The very same took place in China in order to sustain the ability to mint coins that were valued way above their metal content (fiat). Wang Mang assumed the position of acting emperor officially declaring his Xin (Hsin) Dynasty on January 10th, 6/9AD. Nature conspired against Wang Mang for in 11AD, the Yellow River flooded killing many that caused a great famine and a plague. This led to civil unrest as a sign from heaven. Peasants migrated south and banded into larger groups. One of these groups rose, known as the Red Eyebrows, and they were strong enough that they defeated one of Wang’s armies. This led to widespread rebellions even in the capital. They stormed the palace and in a grand last stand, about 1,000 palace guards defended Wang to the last man. The rebels then killed Wang Mang bringing an end to his brief dreams of creating a dynasty. It was the monetary reforms of Wang Mang that reflected also the desperate times. He had installed a new denomination, the daqian, which was 12-zhu valued at 50 times that of the old Han wuzhu coin that was effectively about 20-21 times that of its metal value. 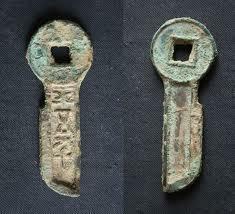 He also introduced knife-shaped coins of bronze in an attempt to revive and depart from the Han coinage. This knife coinage that weighed about 16 grams and was valued at 500 of the Han wuzhu, which was nearly 100 times its weight. He also issued a heavier version of about 28 grams valued at 5000 wuzhu that was 560 times its value with a tiny gold inlay. He outlawed private ownership of gold and he recalled all gold to be turned into the treasury as did Franklin Roosevelt in 1934 United States. With these new overvalued denominations, no doubt these were used to compensate for the confiscated gold. By the end of Wang Mang’s reign, the treasury had a significant gold supply. The knife coinage was abolished for they seem to have served their purpose in paying for the forced confiscation of gold. To help prevent counterfeiting now that coins were valued far above their metal content, Wang Mang prohibited the possession of copper and even charcoal. (Hanshu, 99B: 7b). So you see, whenever government is in trouble, they confiscate wealth. This is why governments are becoming very aggressive currently. The United States is wiping out Americans worldwide presuming anything conducted overseas is to hide money not international business. France has virtually destroyed the gold industry by prohibiting the buying or selling of gold for cash and raising taxes to 75% have been chasing out its most productive people. The more they need money, the worse things will get. This is part of the Sovereign Debt Crisis. If you really think any government will voluntarily give up power, you are praying for an exception that has never existed in history. This is the wave of Creative Destruction. We must collapse before we see reform. Sorry. There is no example in history where government voluntarily surrenders power without a crisis. 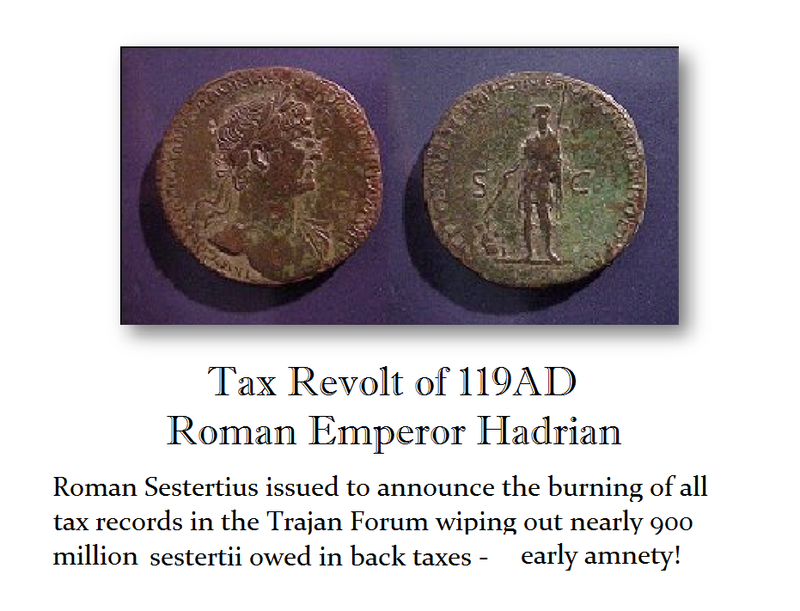 The Roman Emperor Hadrian did not forgive taxes in 119AD without the risk of political unrest. There will be no return to the gold standard. This is all about retaining power. Historically, this has never ended nicely. So to those who say I have abandoned the goldbugs I cannot support a fiction that has never taken place even once in history. We must first collapse, abandon Republicanism and adopt real Democracy where the people vote on EVERY spending proposal and restraint on liberty, then and only then can we quietly look at restructuring the world economy. There will be no gain without the pain. History is truly the catalog of solutions. A return to the gold standard without serious unrest and collapse is a story up there with the tooth fairy.